He is also the founder of the Classic City Brew Fest (Athens, GA) and the Atlanta Cask Ale Tasting. 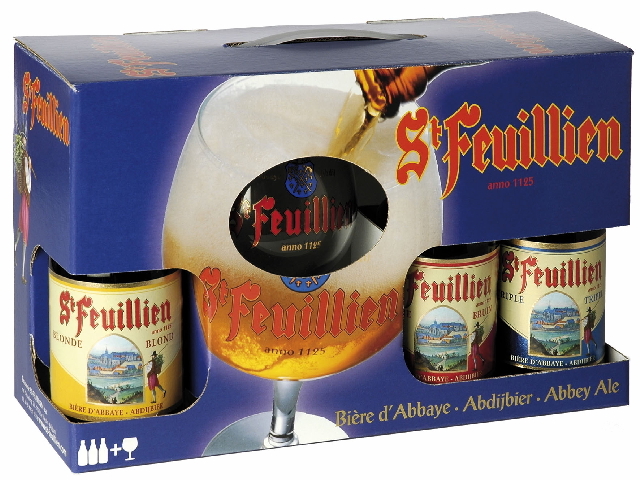 The brewery dates back to 1873, with the Friart family brewing various beers over the years - including St. Feuillien. The fourth generation of Friarts are proud to continue the marvelous brewing tradition. The brewing history of this area goes back even further. The St. Feuillien website explains, "In the 7th century, an Irish monk by the name of Feuillien came to the Continent to preach the Gospel. Unfortunately, in 655, while traveling through the charcoal forest, across the territory of what is now the town of Le Roeulx, Feuillien was martyred and beheaded. On the site of his martyrdom, Feuillien’s disciples erected a chapel which, in 1125 became the Abbey of Prémontrés, but later became known as the Abbaye St-Feuillien du Roeulx. The Abbey prospered until the upheavals of the French Revolution. During these troubled times, it was condemned by the revolutionaries. For centuries, monks have brewed beer and this tradition has been preserved until this very day." St-Feuillien's beers exemplify Belgian-styled ales that are top-fermented and brewed with pure water from a spring located underneath the brewery. Special strains of Belgian abbey yeasts are used to provide St-Feuillien's ales with lovely, complex fruity esters and sparkling carbonation. Only the very best malts and hops are used as well. For example, pale malt is used for St-Feuillien Blonde and Triple, and a blend of caramel and specialty malts make up the grain bill for St-Feuillien Brune and Cuvée de Noël. Secret sugars and spices are also utilized in some St. Feuillien ales to contribute delectable, yet subtle aroma and flavor complexities. Blonde, Blanche, Ambrée, Fruits des Bois, Country Cool. Also look for the new, malty Mac Ben Scotch-style ale from St. Feuillien! Click here to read more about St. Feuillien's ales. Owen: What is the greatest joy of brewery ownership? Dominique: Producing top quality, original products and expanding our distribution. Owen: What has been the greatest challenge for St-Feuillien? Dominique: To preserve the valued tradition of brewing, enlarge the business, and pass this on to the next generations of our family. Owen: Why do so many people love the beers of St-Feuillien? Dominique: It is difficult for me to explain why St-Feuillien beers are prized and special, but it must be because of their particular taste. Our beers are all well balanced products with a fine bitterness, spicy flavour, and a long, delicious finish. Once you taste them, you'll never forget them! Owen: Please describe any special products you are working on at present. Dominique: Besides our regular St-Feuillien ales, we are working now on a new product that is a traditional Saison farmhouse ale. It will be a golden (blonde) top fermented beer, with a second fermentation in the bottle - very natural, full of rich nuances and a slight tang. On the other hand, we'll launched a new fruit beer in our Grisette range - a cherry beer, light in alcohol (3.5 % ABV) and slightly sweet. St. Feuillien's co-owner, Dominique Friart, discusses the brewery's beers in the brewery tasting room. Alexis Briol is head brewer for St. Feuillien. St. Feuillien's malt mill crushes the grain in preparation for mashing. The St. Feuillien brewhouse is a delightful mixture of old and new. Alexis Briol explains the brewing process in the central brewhouse. Alexis Briol describes the process of bottle conditioning to Sachin Patel of Five Points Bottle Shop (Athens, GA). St. Feuillien's delicious ales rank among the best selling Belgian beers in the USA. St. Feuillien bottles most of their beers at a separate, nearby facility, but the brewery still utilizes a bottling line for their range of extra large, specialty bottles. Large, corked bottles of St. Feuillien ales are stored in warm rooms for a period in order to allow residual yeasts to carbonate the beers in the bottle. This is the classic method of bottle conditioning. The exterior of the lovely St. Feuillien brewery. A billboard in the brewery courtyard displays a beautiful woodland trail with St. Feuillien bottle caps marking the way. The slogan reads, "There is a path preferred among the many." The rural, personable Cafe Des Etangs, located near Mons, Belgium serves up delightful conversation alongside the ales of St. Feuillien. 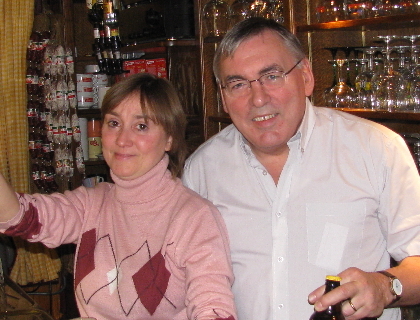 The proud owners of Cafe Des Etangs, Nathalie and Michel Fiévet.